Are you sitting at home? If so, take a long meaningful look around you. If not, close your eyes and imagine standing in your bedroom, kitchen, or garage. Pick a room, any room. What do you see? Now think about how you feel when you enter that room. Do your shoulders feel heavy? Do you feel light and get a spring in your step? Make a mental note of what feelings come up for you and keep reading, as we’ll come back to this in a moment. As I started to think about how to create a life I love, my thoughts immediately went to organizing things. I love organizing and there’s no better time to organize then when two people move in together. My husband and I have only been married for three years, and if you’ve ever attempted to combine two households you know, there are redundancies and things you just don’t need anymore. We’ve spent the last couple of years weeding through our things and we’ve downsized a lot, but I still keep having to purchase more organizing things to keep all our stuff tightly packed into our small home. I’d purchase the newest organizing product and feel joy for a few weeks, maybe even a month, then life moved forward, things got tossed around, and I felt as if I was back to square one, needing to organize the same stuff all over again. Often, this stuff was something I hadn’t used in quite some time and, honestly, don’t really need any more or don’t really like anymore. This seemed like madness; I knew I had to be missing something. I asked myself, “Is there a better way to organize?” A way to approach organization that would result in holding onto the feeling of joy and accomplishment for a longer period of time? Insert Spark Joy, by Marie Kondo. One of my goals in life is to find more joy. The title of this book resonated with me, so I picked it up a few months ago. 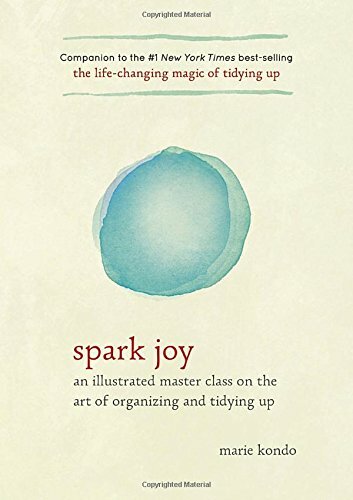 I didn’t read it until this month, and it’s provided me with exactly what I needed, a fresh new way of thinking about organization, which emphasizes one key fundamental point: only keep what brings you joy. Insert lightbulp clicking on above my head. I realized that I had been merely spending my whole life "organizing" crap. Things I’d bought years and years ago for one specific purpose, like a beautiful purple full-length formal skirt that’s now three sizes too small, were retained through the many iterations of my organization. Why had I stored this item for over ten years, moved it four times, and never let it go? Maybe because it was pretty and I thought that maybe, just maybe, someday I’d do something with the material (because God knows I’ll never fit in it again.) Does that sound irrational to you? Maybe not, but multiply this reaction/decision to the truckloads of other stuff I had retained and it sure sounds crazy. So let’s go back to your house and what you felt when you walked into that room? If it wasn’t joy, then ask yourself, “What in this room brings me joy?” And then get rid of the rest. Don’t just move it out into the garage and save it for later. Let it go. Give it away so that it can find someone else to whom it can provide the joy you once felt for it. Keeping only what brings you joy keeps your home lighter and you begin to make purchases around this filter. You naturally will begin to acquire less stuff, you will develop a freer mind, and hopefully you will break the habit of reorganizing a bunch of crap, which does not fill your life with joy, for the rest of your life! And in the future, when you walk into your home, you'll smile because every room, every item will bring you joy. Happy sorting, friends, and cheers to creating a life you love.